Dave Adam pitched well enough in this April 1992 game to receive praise from his opponents, but not enough to get the win, according to The San Bernardino County Sun. "That guy was on," Bakersfield outfielder Brock McMurray told The Sun afterward. "He had a little bit of control problems in the first two innings, then he was hitting his spots, especially the outside corner, perfectly." Adam struggled early in the game, but settled in to go six innings in the 2-1 loss, The Sun wrote. Adam went on to play in a total of eight pro seasons. He never hit his spots enough to make the majors. He made it to AA, but no higher. Adam's career began in 1990, taken by the Mariners in the 18th round of the draft out of Central Connecticut State University. 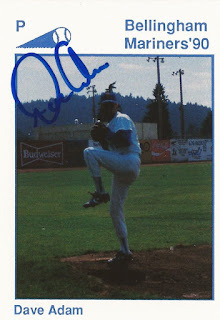 Adam started with the Mariners at short-season Bellingham. He went 4-4, with a 1.43 ERA over 19 outings, seven starts. He lowered his ERA to its final number with a four-hit shutout over Southern Oregon. He then lost 1991 to shoulder surgery. He returned to the field with San Bernardino in 1992, where he went 7-12, with a 5.63 ERA. He picked up his second win in a June game, going six innings while giving up three runs. Adam returned to high-A at Riverside for 1993, then made AA in 1994 and 1995 at Jacksonville and Port City. He went 6-10 in both seasons at AA and had a 4.34 ERA his second year. He didn't play in 1996, but played in Mexico in 1997 and briefly stateside in 1998. He ended his career with two seasons at independent Bridgeport. He had a 4.33 ERA over 29 relief outings in 2000 to end his career. Adam has since turned instructor and coach with Strike Three Baseball in Maine. He also spent time as manager of the Seacoast Mavericks collegiate team, named to the post in 2013.